• The choke manifold is support equipment of hydraulic BOP for controlling well blow out and well pressure. Through the choke valve, perform well killing, replacing polluted slurry in well. • Control wellhead pressure of casing and standpipe, restoring mud to control pressure at well bottom to stop overflow. • Through relief pressure, decrease wellhead pressure to perform “Flexibility Shut Off Well”. 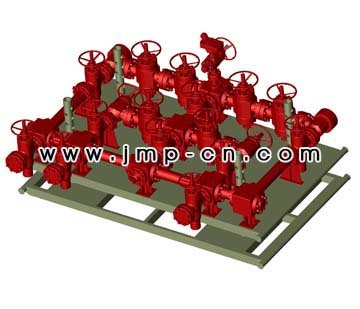 • Through drain valve, decrease casing pressure of wellhead to protect BOP stack. • Furnished with hydraulic control pod to achieve the function of remote control.